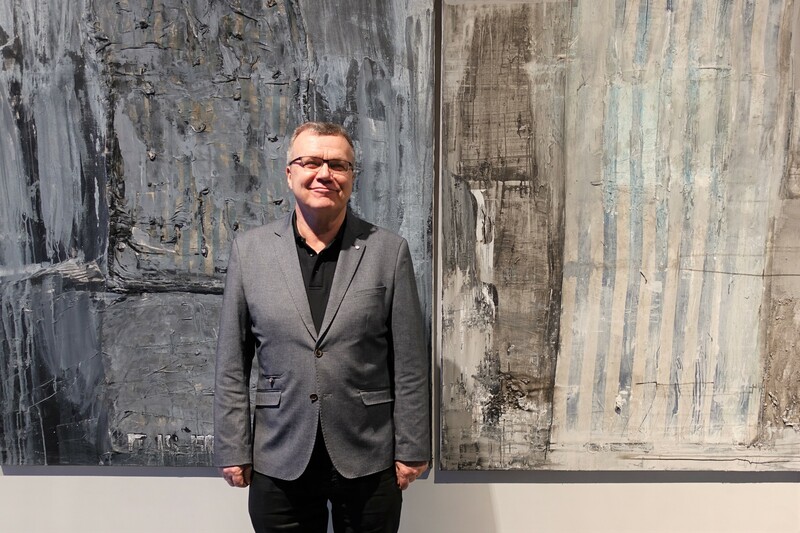 Jaan Elken has said that as a painter, he navigates an aesthetically disturbed world which aims to connect to the viewer from a more universal and global position. "I talk about senses and instincts in my paintings, how I sense things. These are very specific. There is nothing abstract about this, inasmuch as art is "abstract", "conditional" or "signified"," he says. The exhibition "Poem to mattress 2" takes an abstract painting language and talks about very realist associations and experiences. The seriesincludes actual mattresses as leitmotif, adding a nostalgic and intimate element to the paintings – diving into personal layers of memory, including also the early childhood years in Sibir with parents who had been deported there. The paintings refer to experiences, real situations, emotions. For the first exhibition, titled "Poem to the mattress" in Artdepoo gallery in 2008, Elken wrote a poem where the lines „... striped robe - white plastered wall – moist mold - humidity from the climate and wrong construction - scratched words...“ were born from his memory fragments of his psychological experience. Rauno Thomas Moss has written: "Elken’s mattresses are somewhat terrorist. Even the place where we lie to temporarily escape from the cruelty of the world becomes an altar, which has been consecrated with sweat and urine; a place where the last sacrament is given. A bed is charged with symbolism and the mattress itself defines many meanings which influence descriptive language." The mattress motif in the Jesus Christ Superstar series ties the exhibition into a coherent whole. Eero Kangor has written: "Being a deportee is a two-edged sword, as was being a survivor of nazism crimes or Nagasaki, this is sometimes hidden rather than showcased. Exhibiting these in this manner can be interpreted as something self obsessed and thus a subject for critique. The same was also the case with Jesus Crhist who lacked the power to help himself." Reviewing the last mattress exhibition, Riin Kübarsepp wrote: "Elkens story talks about pain and horror not because the themes are there, but also because the storytellers role requires a level of abstraction of something where the internal side is marked by pain and he external by horror. Dreams on different matrasses are rarely hopeful. Perhaps this is all a confession, tears that have soaked the mattrasses. Also Christ confessed to Pontius Pilatus with tears. So confession has in this manner had this element of persecution and suffering. Elkens mattrass project can in this manner be called the social portrait of Estonian art." The exhibition is open at the museum's café (B-entrance) until January 13, 2019.